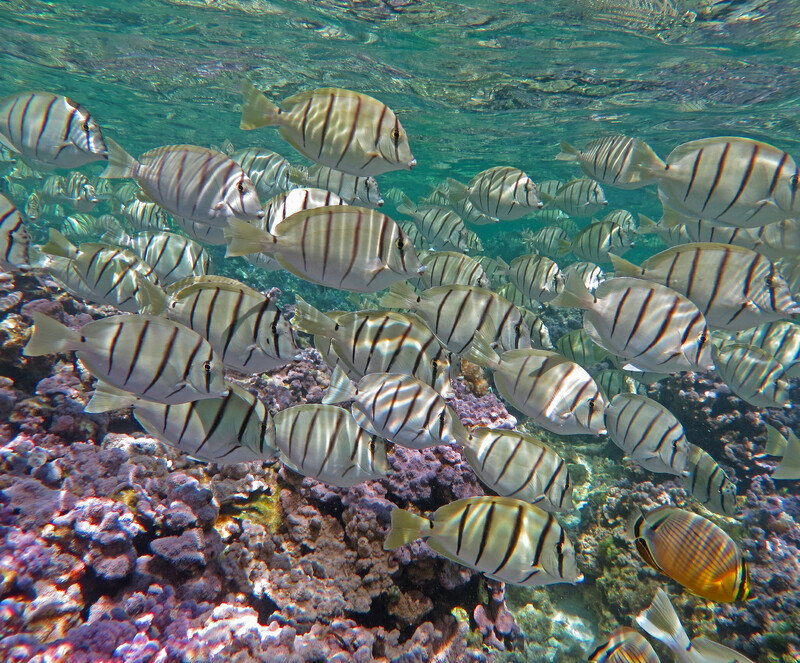 The waters surrounding Midway Atoll NWR are home to at least 266 species of fish, including 7 pelagic species; some are endemic to the Northwestern Hawaiian Islands (NWHI) or very rare in the Main Hawaiian Islands (MHI). Fish diversity in Refuge waters isn’t as high as that found in the MHI, perhaps because Midway is near the northern extent of the NWHI and its waters are much cooler. 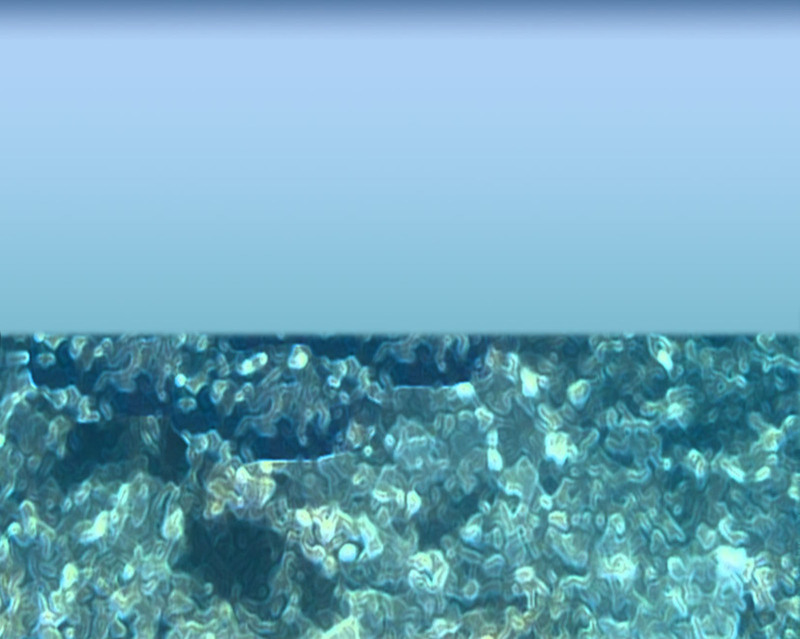 Overall, fish biomass is higher in the NWHI than that found in the MHI. 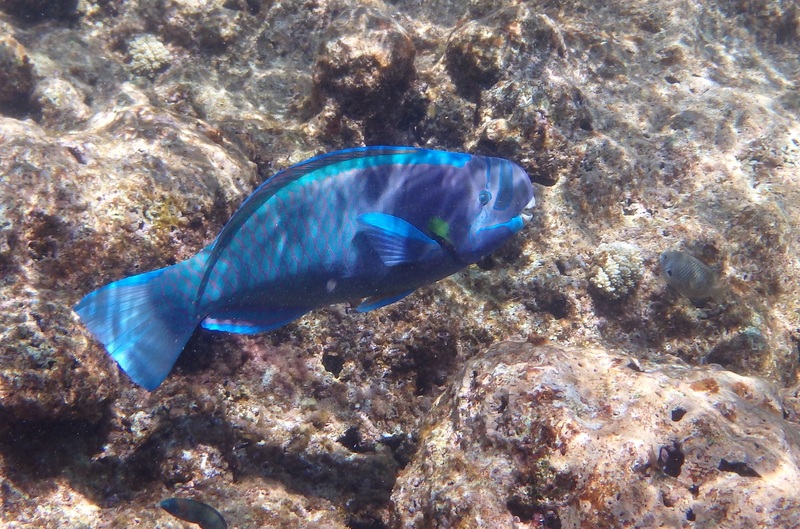 Compared to other NWHI locations, reef fish populations are lower at Midway, likely due to years of human activity, including fishing, at the atoll. 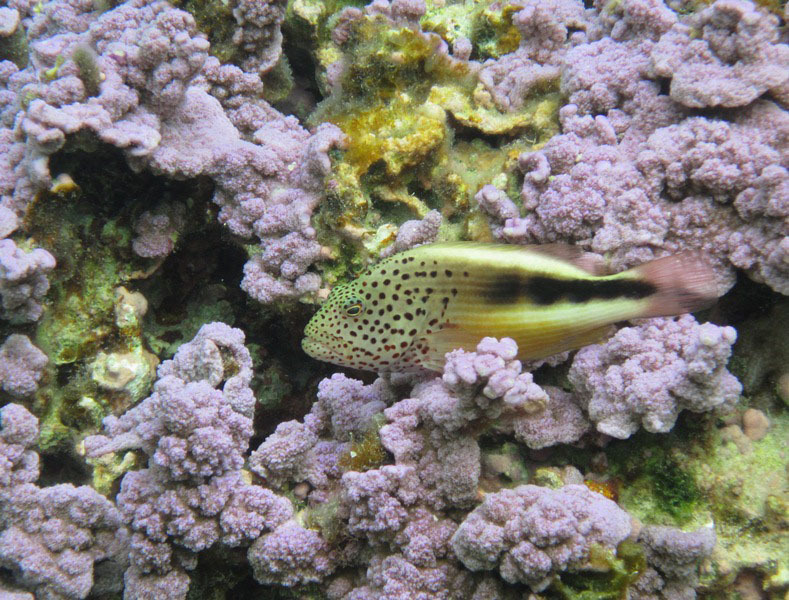 The Hawaiian grouper (hapu’upu’u, Epinephelus quernus) typically occurs at much greater depths elsewhere in the NWHI and Main Hawaiian Islands (MHI) (up to 300 feet at MHI); at Midway and Kure atolls, divers encountered them at shallow depths, sometimes in assemblages with masked angelfish and knifejaws. Jacks, called ulua in Hawaii, were less common at Midway than elsewhere in the NWHI. 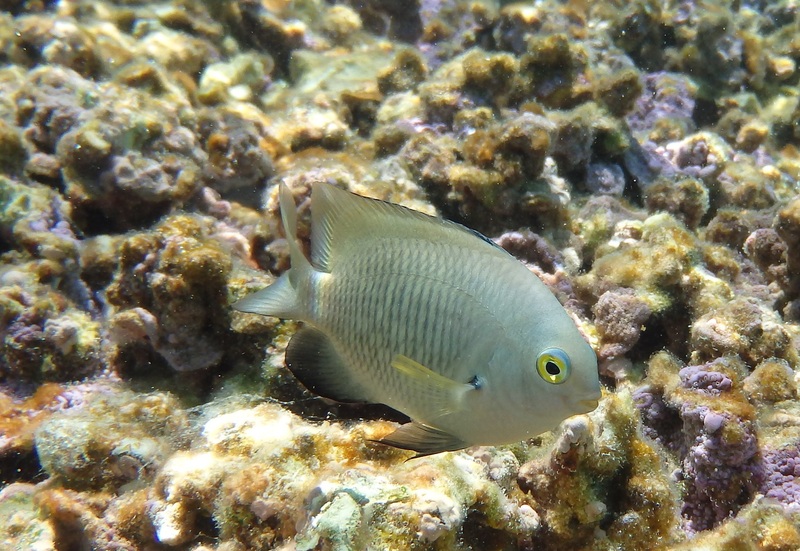 At least 17 species in the “jack” (Carangidae) family have been recorded at Midway; the Hawaiian Thicklipped Jack (Pseudocaranx dentex) is among the most common. The Whiskered Boarfish (Evistias acutirostris) and Knifejaws (Oplegnathus spp.) 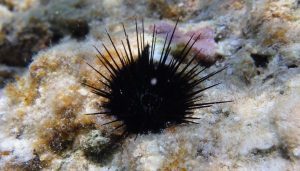 are rare elsewhere in the Hawaiian archipelago, except at Kure and Pearl and Hermes; researchers observed them under many of the overhangs. A huge diversity of marine invertebrates inhabit Midway Atoll NWR’s lagoon and surrounding waters, including algae, corals, worms, snails, and seashells. A total of 29 species of coral have been recorded at Midway Atoll, along with more than 100 species of algae, including a seaweed species new to science, Dudresnaya babbittiana. 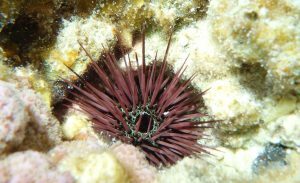 Marine habitats, including spurs, grooves, and sand channels, are home to several algaes, seagrass meadows, urchins, bi-valve clams, sponges, and more. 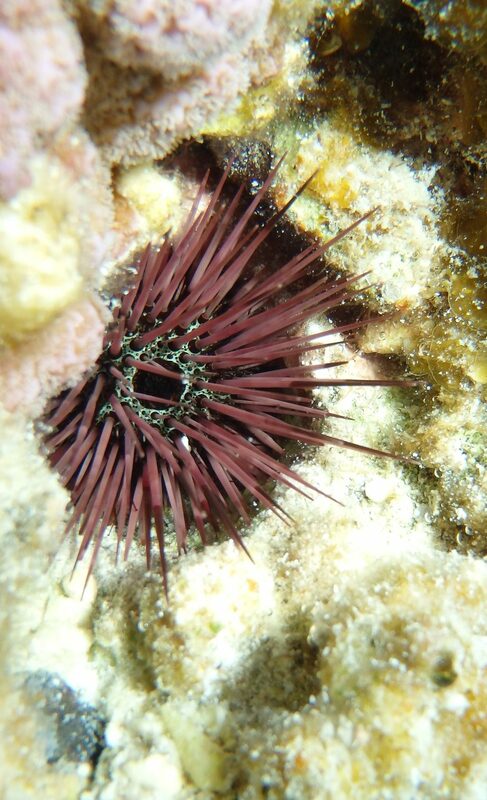 Common species observed include the Rock-boring Urchin (Echinometra mathaei – pictured below left), Long-spined Sea Urchin (Diadema paucispinum), Needle Spine Urchin (Echinostrephus aciculatus – pictured below right), Pied Brittle Star (Ophiocoma pica), Sacoglossan Sea Slug (Plakobranchus ocellatus), and Rhynchocinetes species (shrimp). For more information about Midway’s other marine life (including algae, corals, snails, and seashells, mollusks, crustaceans, and more), check out the USFWS’ checklist here.